We are proud to offer our drivers an exceptional travel center with all the amenities that over-the-road drivers need. If you have any questions about our truck stop and amenities, please don't hesitate to call us at (330) 534-8166. 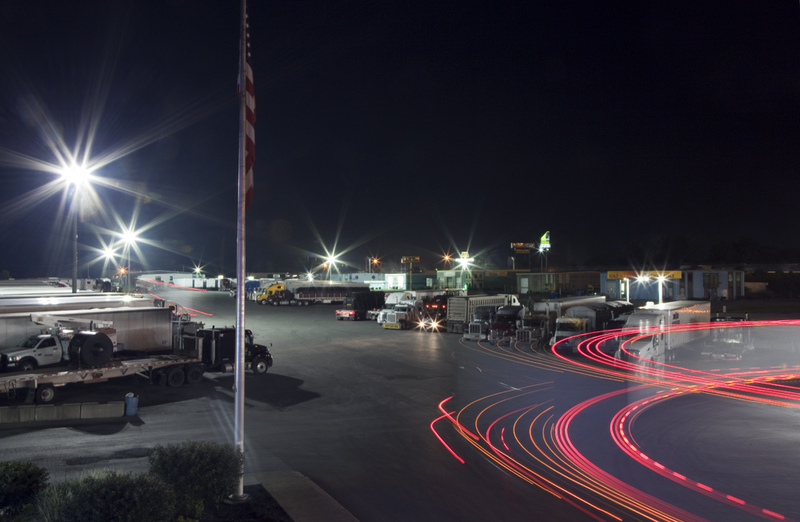 Our state-of-the art State Certified Scale is conveniently located at Truck World, adjacent to the fuel islands. Driver's can utilize our on-site scale 24 hours a day, 7 days a week. The cost is $8 per weigh. Truck World has over 500 free-parking spaces for drivers. All our parking is conveniently located next to the Truck World travel center, within close proximity to our showers, The Globe Restaurant, Erin's Pub, The Tango Whiskey Casino, Jo Jo's, Hot Dog's, Travelodge & more. We offer No Fee Check Cashing for fueling customers (limit $200). Non-fueling customers can cash checks for a fee of $2. ID Required. No Payroll checks. We offer several ATMs on-site for convenient access to cash. We are proud to offer our customers clean, modern, spacious shower facilities. Showers are available 24 hours, 7 days a week. Fueling customers who purchase more than 75 gallons receive a FREE SHOWER. Showers are $3 with a purchase of 25-74 gallons and $7 with purchase of 0 - 24 gallons. Fedex, UPS, and United Postal Service drop boxes are located on-site for package drop-off. Pick-up is available Monday - Friday for all three services, with the exception of holidays. TripPak EXPRESS™ creates better cash flow for fleets by making it easier and more convenient for drivers to submit their trip documents. With options to fit any fleet’s budget and delivery needs, TripPak EXPRESS provides more savings for fleets than traditional shipping methods. TripPak EXPRESS Inbound Service: Get your paperwork fast! Drivers drop trip paperwork in any TripPak EXPRESS drop box, located at over 1,500 locations nationwide. We scan it and send it to you electronically while your originals are safely archived; saving you time, space, and costs. TripPak EXPRESS 2nd Day Service: Driver paperwork is picked up and delivered to your location in 2 business days! TripPak EXPRESS Next Day Service: The best way to get your originals overnight! TripPak EXPRESS Consolidated: Your drivers drop trip paperwork into any TripPak EXPRESS drop box. Once each week, TripPak sends your consolidated paperwork to you, enabling you to begin billing, process payroll, and cut costs – all while keeping your original documents! The Truck World travel plaza features four fun-packed games rooms for entertainment. Don't miss The Tango Whiskey Sweepstakes, games of skill, video arcade and more. Free Wireless Internet is available throughout the Truck World travel center, Travelodge hotel and parking lot. Log on to our wi-fi hotspot anywhere on location. We have several laundry machines available for drivers 24 hours a day, 7 days a week.